Driving is under way at the Alltech FEI World Equestrian Games, with the dressage phase kicking off the competition at the lovely La Prairie racecourse in Caen. Some 23 drivers performed their tests in front of 3000 spectators from all over the world, who enjoyed the sport as much as the lovely Normandy sun and mild temperature. First starter IJsbrand Chardon (NED) set the provisional winning score from the onset driving his team of mixed warmblood horses. The four-time world champion had an early start and prepared his horses before sunrise for their performance in the arena. “I was not pleased with the fact that I had to warm up my horses in the dark early this morning,” he said after completing his test. Despite the early start, Chardon drove a nice test. His horses showed very good balance, forming a perfect block. The Dutch driver, who was assisted on the dressage carriage by two of his daughters, has been working hard all year to find the right set up for his team and performed his best test of the season. His compatriot Koos de Ronde drove his team of showing chestnut horses to second place. De Ronde, who finished fifth at the Kentucky Games in 2010, is aiming for a top-five placing in Normandy. The 37-year-old marathon and cones specialist was happy with his horses despite a few mistakes and is looking forward to the remaining competition phases. Christoph Sandmann (GER) is currently lying in third place. Sandmann drove a good test with his team of KWPN geldings. Some of these horses are used by his daughter Anna in her pair with which she successfully competes at international level. Sandmann, who has competed at every FEI World Equestrian Games since 1990, was not pleased he had to compete on the first dressage day, but since the starting order was determined by a draw, he accepted the decision graciously. The provisional fourth place went to Fredrik Persson (SWE), and Uruguay’s individual driver Ernesto Colman Mena was a surprise in fifth position with his expertly presented blacks, finishing on 53.27, with Belgian youngster Edouard Simonet close behind in his WEG debut. The 24-year-old who has been driving since he was a child, trains with Boyd Exell and dricves a team of Arab-Friesian horses. Wilf Bowman-Ripley put in the best performance for team GB, now sitting in seventh position. The nephew of Britain’s “grandfather of driving”, George Bowman – at 78 the non-travelling reserve of the British team – had expected better, but had last-minute horse problems and left his most experienced horse at home. He had to take his left wheeler up to the front and was then facing problem because the two front horses were not well enough used to each other, resulting in tension in walk. Best performing French team driver Benjamin Aillaud sits in eights position (55.16). US driver Alison “Lisa” Stroud, coming out as the last competitor of the day, drove stylishly to ninth place, her chestnuts that she bought only some months ago from Daniel Schneider in Germany, showing flamboyant knee action that drivers appreciate. Driven dressage will resume on Friday with Poland’s Piotr Mazurek first in the arena at 9.30am. 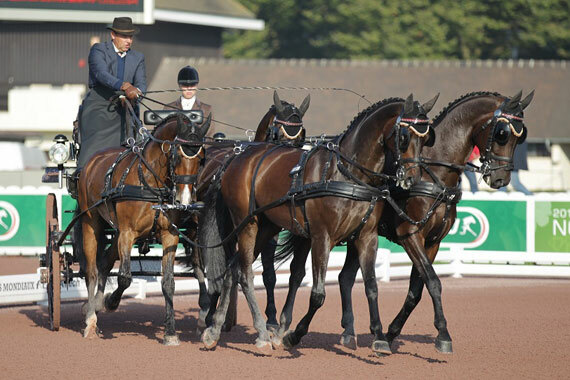 All eyes will be on reigning European champion Theo Timmerman (NED), reigning world champion Boyd Exell (AUS) and 2012 silver medallist and current number 1 on the FEI World Driving Rankings Chester Weber (USA). The last competitor in the arena will be József Dobrovitz of Hungary.